Wondering what kinds of questions your child will be asked on the California Gifted and Talented Education (GATE)? Here are six sample California GATE practice questions. IMPORTANT: While the California GATE sample questions shown on this page are representative of what your child will be seeing, they aren’t taken directly from the actual test being administered this year. Look at the abacus below. The beads form a pattern. The beads for the 6th rod are missing. 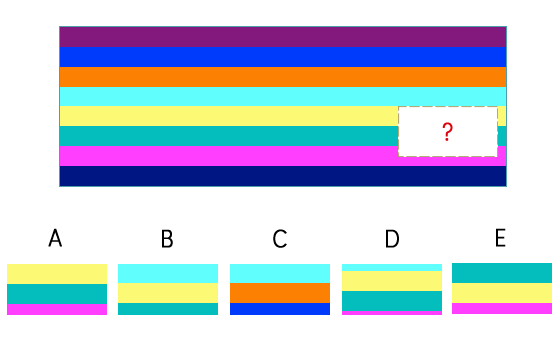 Choose the rod that goes in the 6th place to complete the pattern. Choose the box that has the shapes that include neither a circle nor a square. Choose the picture that shows this: Cindy dived off the board, but has not yet hit the water. Look at the shapes in the boxes on top. Do you see how they are related to each other? 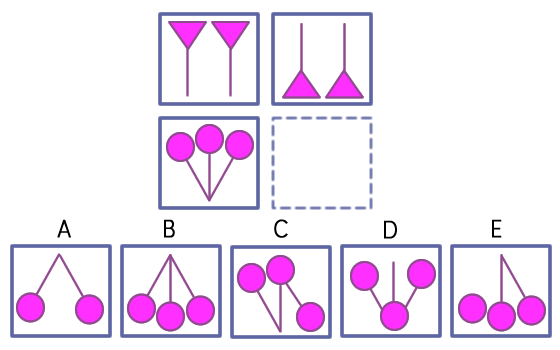 Can you find the answer that goes in the empty box, so the shapes in the bottom row will relate to each other in the same way as the shapes in the top row? Look at this puzzle. There is a piece missing. Touch the answer that shows the piece that completes the puzzle. Thank you for showing me this website. I shall be taking this test tomorrow. This is so helpful!!!!!!!!!!!! I have a question does it get even harder? If it does thank you cause I wan to challenge myself. The questions on this test are easy, it’s just that I have a question ; do the questions improve? Taking this test soon and i’m really nervous cause it determines pretty much my next few years. I really appreciate the work that is put out there! Hopefully I can find harder questions on this website. I love this I’m in 2nd grader and I got 5/6 on my first try. I hope it helps me tomorrow! This was so helpful for me because i have a GATE exam and i hope i will secsed in the GATE exam i know i will because of this THANK YOU VERY MUCH!! You can log in to the TestingMom.com members portal by clicking log in in the upper right of the website. From there, you can set up your own program to see practice questions specific to the test your child will take. You can also live chat, email, or call us for additional help! I’m a third grader and these are too easy. Do you have things that are third grader cause tomorrow in Millard and Mrs. Harrison said I need a good sleep, good dinner, and good breakfast tomorrow! I am a U.S./California native, educated in the ’60s and ’70s. I’m very happy that the correct past tense of the word “to dive” was used. I cringe when I hear Americans ubiquitously say “dove” (long “o”). Don’t trick people saying they can get 100 practice questions free by providing an email. This is really bad business practice because there is actual no questions being sent to the email as stated. .
You can view the 100 free practice question here: . You must be signed in to your TestingMom account (email) to view them. Im taking the test next tuesday and is the gifted test fun? I just had my 8 year old 3rd grader complete the 5 sample questions and he got them all right. What does that mean? Are the GATE tests the same for every grade level? I’m taking the GATE test in eighth grade, so I’m a little fearful that they may make my test harder.